Little Tavern Shops was founded in 1927 in Louisville, Kentucky by Missouri native Harry F. Duncan. The first location in Washington DC opened in 1928 and the first in Baltimore, MD opened in 1930, expanding into the Maryland and Virginia suburbs in the later 1930s. Little Tavern officially relocated their operation to Washington DC in 1941 and the last Louisville location closed in the early 1950s after operating in isolation for a decade. The company continued building new Little Tavern locations in the 1930s tudor cottage mold into the mid 1970s. In 1980. Duncan sold the chain to Gerald Wedren, who set about revitalizing the chain, restoring several of the original locations and opened a number of new ones in less traditional storefront locations, shopping centers and malls. Losing market share to fast food and losing locations to development, the chain went from roughly 36 locations in 1980 to 22 eight years later. In 1988, Wedren, along with his parters, Senator Howard Metzenbaum and Barbara Bonner (operating as GEW inc.) sold to Roger W. Kisiel and Joseph R. O’Brien, Fuddruckers franchisees operating under the name Atlantic Restaurant Ventures, Inc.. O’Brien and Kisiel had plans to re-vamp the menu and image of Little Tavern. Amid allegations of fraud relating to the sale in 1988, Little Tavern closed in 1991. Several locations were bought by former employee Alfred Wroy, with one new location opened, and run until the last closed in 2008. The trademark was bought by James Cumbest who has so far unsuccessfully tried to license the name to franchisees since 2009. Before opening the first Little Tavern, Harry Duncan operated a chain of hamburger restaurants in St. Louis, MO. Described as “Baby Beef” shops, I have so far been unable to find any secondary confirmation of that name beyond articles quoting a single interview given by Duncan in the 1970s, and have been unable to find any addresses or photographs. Purchased by Herman A. Parris, a former employee of Little Tavern, in 1935 and reopened as White House Shop no. 1. Remodeled in late 1930s-early 1940s. Opened May 6, 1931, Restored 1983, Demolished 1988. Opened August 1, 1931. Closed early 1990s. Moved to 1309 New York Ave, Washington DC in 1936. Moved (streets renumbered?) to 1251 New York Ave, Washington DC c.1956. Opened March 22, 1932. New backbar 1956. Closed April 11, 1969. Demolished 1972. 1936 Little Tavern Shops company photo, courtesy Larry Collier, courtesy Scott Stone. 208 N. Eutaw St., Baltimore, MD. Filming location for “Dawn Davenport, Career Girl” scene of the John Waters movie, “Female Trouble”. Still standing. Opened February 4, 1937. Relocated? Across from Pimlico race track. Harry F. Duncan, founder of Little Tavern, was a major fan of horse racing and opened shops both here and down from the Laurel race track. After a day of losing big at the horse track in May of 1954 with his friends J. Edgar Hoover, Clyde Tolson and Theodore McKeldin, Duncan had his limo stop at this location and told the Baltimore offices to “leave the pickles off the hamburgers for a few days until I get even”. 115 Washington Blvd, Laurel, MD. Built June 6, 1961, Restored 1983. Opened August 31, 1940. Closed early 1990s. Photo from before it was heavily remodeled here. There was a location in Rosslyn VA. Opened November 14,1974, closed after 1990. At the time of its opening, it was the 13th operating in the Baltimore area. Opened April 1983. Closed 2008, the last operating Little Tavern. 2601 Columbia Pike, Arlington, VA. Converted from an Ollie’s Trolley to a Little Tavern in late 1983/ early 1984. Virginia No. 4. Light Street Pavilion, second floor, Harborplace, Inner Harbor. I could provide a photo of the Wheaton, MD shop (Viers Mill/Grandview/Reedie), taken in the spring pf 1997. Amazing historical work! When are you coming to NOLA? We have great subject matter for you plus fun! Dinerman, I may have gotten lost in the list, but I think you missed two in northern Virginia. There was one in Old Town Alexandria (that’s now a Jerry’s) at the upper end where the GW Parkway becomes Washington Street. I’m not sure from the address if you caught the one in Arlington (Rosslyn/Spout run section) next the to pawn shop; I think it is a photo store, although I haven’t checked lately. There was also a Little Tavern on Wilson Blvd in Arlington. I worked there while going to college. I remember that also. I mostly hit the one on Lee Hwy. by National Pawnbrokers. Are any of them still opened, do you know? Type in Facebook “Little Tavern Laurel MD” their current Facebook page will appear with a picture, directions, and ratings! Back in the last century I was a student at the University of MD in College Park. They had a bizarre meal system that would frequently result in one’s being left for a period of days without enough ‘points’ left in one’s account to eat at one of the dining halls. As impoverished students, we became very familiar with the Little Tavern on Rt. 1. I recall at the time that the burgers were sold by the “little bag”…”big bag”…”jumbo bag” etc….to denote a bag of 3, 6, 12 or whatever hamburgers. At that time they were also marketing the burgers with a “deluxe” designation. Those of us in the know NEVER used that terminology. We would order a “big bag with the Little tavern salad bar”….That meant that you wanted the burgers with a pickle, onions, and a leaf of lettuce…. This is great! I am he grandson of Robert F. McFadden, Sr. who was the president of Club LT and cousin of Harry Duncan. I miss those little burgers and would love them to make a comeback. I still have a bunch of the old Little Tavern shwag around my house. I am amazed this site has slipped by me for so long! I am the true Little Poster boy! I am from the generation that preceeded the french fries, hot dogs, xhicken sandwiches and so on. the real LT never would have tolerated such nonsense! I grew up in Chevy Chase & went to B-CC Hi (’73). I can remember skipping classes with a couple of friends to hit “Club LT” (that really is what we called it) around the corner from the MCP Station. I always had 6 small with cheese & mustard/ketchup. I know every Little Tavern regular remembers the third squeeze bottle which contained mustard and ketchup already mixed. Also, remember how the cheese was applied? For the sake of those who forgot or didn’t like cheese, it was like this – the cheese (about 1/2 slice) was tossed on the grill to melt. Just as it melted, the cook used the roll to “mop” the gooey cheese off the grill and re-assembled the burger! I was literally drooling by the time I got my bag! I still make small LT cheeseburgers fairly often and they taste exactly as the originals. One of my friends from those B-CC days stops here at least a couple times a year for them and agrees! I was born in ’54 and never remember any McCormick spices being used at any of the LTs in Bethesda, Silver Spring, Laurel, Georgetown, or elsewhere. It was only salt and pepper. Period. Also, the re-hydrated onion was always (to the best of my excellent memory) pressed into the still sphere shaped burgers by hand and once salt, pepper and onions were added, the spatula was used to flatten the meat. Finally, the biggest secret to making the burgers just like the origuinals is the cooking of the meat. If this is wrong, nothing will fix the burgers! I have searched for LT collectibles for years with little success. I drove countless miles over the years to be disappointed over and over again. I am now disabled with severe arthritis and can no longer physically take the long drives in search of a neon sign or any LT collectibles. Maybe I will have better luck online! At least I still get to enjoy the great taste of my favotite cheeseburger! I hope this great site continues to attract Club LT fans, it is really great! Check out eBay under “Little Tavern Shops”. Original Stuff there! Sorry about your disability but you need not worry about making trips to look for Little Taverns. They are all gone. The last one closed in Laurel Md. in 2010. I had my last 1/2 dozen death balls there the month before they closed. The Laurel location (although now operating under the name “Laurel Tavern”, did bring back the burgers, by the original 1930s recipe. They’re much better than the re-worked recipe ones used in the final days of the chain. Michael, I see that someone is supposed to be opening in Balto area but I cannot find out where. Do you know? Sorry to hear about your illness. Where ctually are you located? If I can talk you into an ivitation I might be able to visit you for a taste of a burger you say is a good copy. Hi, I recall meeting your dad along with Harry Duncan and a man named George Mathis. My dad was a regional manager for the company and spoke highly of everyone. I also worked there for awhile while attending college. I have such fond memories of the iconic restaurants. I’m Ross Smith. The Son of Eddie Smith who was the Head Supervisor of LT for 43 years. I new your grandfather and worked at many of the shops. I was born in Washington, and my dad introduced me to LT burgers when I was quite young- he worked for Greyhound, and there was a LT by the old Greyhound garage on N.Y. Ave. In later years, I often imbibed in LT culinary delights in Georgetown- not on Wisc. Ave., but the one sort of in an alley on around 30th (?) St.
Little Tavern’s had good burgers and good coffee at a fair price- what’s not to like? The photo of store #13, Balt. #2 is absolutely gorgeous. The images of the architectural monstrosities that were once these quaint and aesthetically-pleasing buildings are discouraging, to say the least. Now I know why my grandfather bragged about Packards. Little Tavern joins a long list of defunct Washington landmarks. Thanks for the memories. is there any chance that anyone is going to bring little tavern back? a very good idea if i must say so. yes, we are coming back really soon! Barb, I dream of LT coming back. Are you serious about any coming back, if so where and when? So far it’s been over five years since the current owners of the name were supposed to open new locations. Nothing has come of it, other than a website that plagiarizes some of its content from my site, and a run of mugs, which appear to have been sold off on ebay to cut losses. We are coming back! Really soon! I just purchased a “LT Toothpick Holder” at an action here in Pa. Does anyone have any info on it? It is inn the shape of the LT resturant and made of lucite. (It’s done in the orginal green& white with brown trim. The roof has the “Little Tavern” loogo on the very top and on the peak of the roof it says :Little Tavern Shops” 1927 1947 20th Anniversary. It slides open to hold toothpicks…inside we found a silver lapel pin that has “BAMA Little Tavern Shops” Any info would be appreciated. I grew up in the DC area and remember eating LT Burgers….YUMMY!! I also have a Little Tavern toothpick holder. It is open and does not have a sliding top but everything else is there. It is very old plastic and is in very good condition. I would like to sell it and anything you can tell me would be appreciated. Please call me at 301-598=9747. I live in Silver Spring Md. My e-mail address is gngpearlman@yahoo.com Thanks, George Pearlman. It was so refreshing to find my old late night haunt-Little Tavern after work late at night-weekends only, when I was in high school. This was in “downtown” Bethesda, Md. on Wisconsin Ave. I was back there a week ago found the place was still there except for the price increase. It was 25 cents each then and 30 cents with cheese. Next time I come back to Bethesda, Md. I’ll make sure that my young children get a chance to enjoy my childhood junk food and I hope that Little Tavern will survive when they grow up with their kids. Unfortunately, where I live now Houston, Tx., people don’t know Little Tavern hamburgers but do know White Castle! Yes, I am sorry to say that this place used to be a Little Tavern. Probably the last bag of burgers I ever purchased was from this location. I saw no mention of it here but I believe there was a LT on Back River Neck Road in Essex, MD 21221 until the late 70’s or early 80’s near Contry Ridge Shopping Center. I seem to recall a Little Tavern in Arlington Va. (Clarendon). It sat across the street from Penny’s, which is now a Metro Stop. It was on Wilson Blvd as I remember, but the picture I see, doesn’t match my recollection of this Tavern. Were there 2 locations on Wilson Blvd.? After shopping at Penny’s, we would often stop and pick up a bag or 2 of those famous little burgers. In the early ’40s we would walk in to Clarendon on Saturday afternoons to see a movie at the Ashton Theater, and the LT was just across the street. I ate there a number of times, and the burgers were very good! It would be great if the chain would reopen. McD’s wouldn’t stand a chance! Hi, I worked at that Little Tavern in Clarendon while going to college manh years ago. It was the only one on Wilson Blvd. There was a second one on Lee Highway near Spout Run and I worked at that one also. Yes, good food at a great price. My dad was a regional manager for them. My dads store was located at 634 N. Capitol Street. Right next door to the LT and across the street from DC Post Office. I am looking for a picture that would show my dads store and the little Tavern if anybody has a picture of that LT I would love to see it. ALSO I have an old LT walking stick and a plastic model of a Little Tavern I picked up at their headquarters many years ago. Looking at them sure brings back memories. I don’t have a photo of the N. Capitol Street Little Tavern, or Jack’s dad’s shop, but I have a picture in my head. I ate there several times when I came home through Union Station. Took my daughter to a Nats game and found my way by dead-reckoning, but couldn’t recognize anything at the top of North Capitol. How it looked is how my mind believes it still is. good day to you.If you are talking about the little store to the right of Little Tavern on North Capitol St, I remember it well. I remodeled the little tavern after it caught fire in the early 80’s and did maintenance on it until the DC Government closed it. I used to visit the store and talk with the owner and of course buy stuff. I do have a picture of the Little Tavern after I remodeled it. If you ever get this reply and can get back to me I will try to find it and get it to you. I seem to recall that there was a Little Tavern on Reisterstown Rd near Northern Parkway. Could be wrong though. I was a regular at the Little Tavern on Georgia Avenue in the early 1970’s . Central delivery was just behind it . I moved to Houston and jus three years ago returned to the area . Thank you for preserving one of the few GOOD time places I had when I worked in the area ! Little tavern was always our last stop after a night of running the roads as a teen in Wheaton Md. back in 1967-69. My parents would get them for the 5 of us for dinner. One night as a teen 3 of us went in to see how many we ea. could eat. I downed 9 and another guy ate over 12. He just did make it outside before he lost it. I do remember it was a bad idea eating them before a date due to the blast of gas that later followed. After getting out military and moved to N.Va. I found myself hittin’ the Tavern again. Good ole days. I liked the recent comment calling for the return of the Little Taverns. What I would really love to see is an investor who could go around and buy up all the remaining stores, restore them, and make them into the latest thing to do–maybe add wine. I have such fond memories of the one in Clarendon. Thank you for the comeback. If you learn of any shops coming back please contact me. They’ve been working on the “comeback” for seven years now and have yet to open a single location. Don’t hold your breath. I hope this is Terry??? Thank you for the update. I do hope to see another Little Tavern (or a White Tower) in our area. It was a disaster for me when the Broning Hwy store closed. I had to pass by that store every night on my way home from work so I treated myself regularly. Then, after a long interval I stopped by again and the store was still there but the burgers were not the Little Tavern sliders. That was how I learned that the store was no longer a Little Tavern. I’d love to see someone open a franchise, I d have no trouble traveling 50 miles for a “bag full.” Pulaski Hwy is very convenient for me. I hope it’s true. I don’t see them opening in a mall, I have written many mall contracts and they are so expensive that I doubt that the store could sell enough burgers to pay the rent. I did buy a Little Tavern coffee cup several years ago on the Internet but it has disappeared. A friend of mine was using it when he got busted for a DWI and the cup was in his van. The van was towed and I never saw the cup again. We came this close to losing our friendship over it. I hope this forwards to your location. In the future please sign your mail to me and give me an e-mail address if you would. There was a LT in the 100 block of Independence Ave SE, across the street from the Library of Congress, southside. I have a friend who has a Little Taven in his back yard in what he calls The Neon Garden. As the name suggests he has a collection of neon signs too! You are correct about the LT on Lee Highway in Arlington. That Torbash place used to be a tavern. They remodeled, but part of the old building remains. It was the place I bought my last bag at in ’92 or ’93. 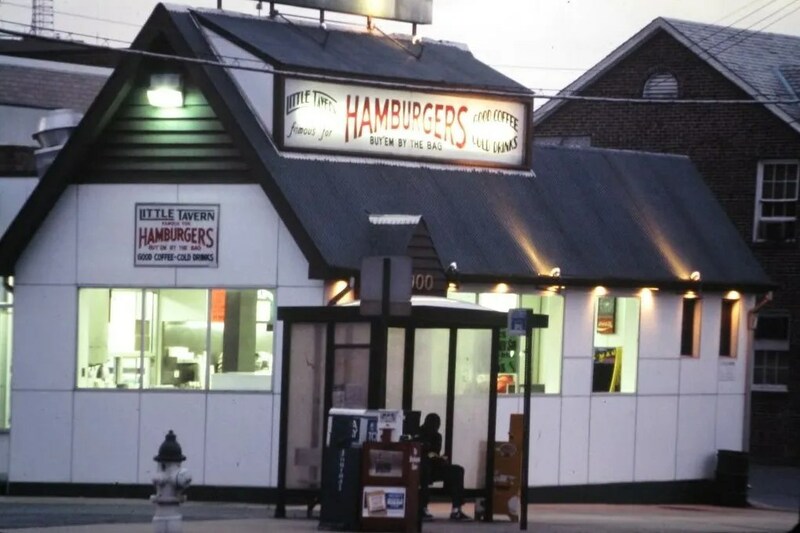 No mention of the Little Tavern Hamburger establishment once located in Glen Burnie, Md –off of Delaware Avenue, cross street DrumPoint Ave.
It’s there, along with a photograph. The most fondest memories growing up was Little Tavern, the last location I ever found was on Browning Hwy. Near the old GM plant. A large piece of me died when they closed, I loved them so much I had them at my wedding reception. I don’t know how, but one day I will open one up again, exact replica of my last piece of hraven, it sounds pitiful but may it rest in peace and God bless the founder Mr Duncan he made me very happy along with many other people. I want a BAG NOW ! I live in Baltimore and will travel a fair drive to get some burgers for the wife and myself HELP !!!! Growing up near Wheaton in the mid 50s, we would frequent the LT there, burgers were 5¢. Then in HS we would go to the one on M Street after partying in Georgetown. The last bag I remember buying was in the 80s from a location in Arlington – I think. Man, I love and miss those burgers! Yeah, me too! Lots of fond memories, working with the employees was always a great time, knowing the owners was a pleasure. They are on the way back, starting in Baltimore, but the burgers oh! the burgers!!! I hope this is Terry??? Thank you for the update. I do hope to see another Little Tavern (or a White Tower) in our area. It was a disaster for me when the Broning Hwy store closed. I had to pass by that store every night on my way home from work so I treated myself regularly. Then, after a long interval I stopped by again and the store was still there but the burgers were not the Little Tavern sliders. That was how I learned that the store was no longer a Little Tavern. I’d love to see someone open a franchise, I’d have no trouble traveling 50 miles for a “bag full.” Pulaski Hwy is very convenient for me. I hope it’s true. I don’t see them opening in a mall, I have written many mall contracts and they are so expensive that I doubt that the store could sell enough burgers to pay the rent. I just ate at a place called Osman and Joes Kitchen at 4700 Wisconsin Avenue in Northwest Washington this morning. It certainly looked to me like an old LT to me but when I asked the waitress if that was so, she said no. Do you know if it was an old LT? Thanks fo your quick reply. I forgot about Toddle Houses. I was born in DC and my father was a District Manager for LT. I have a few items that he gave me, one being a pewter stein which I passed to his grandson. I also have some of his service award pins. I would go to LT late night after having partying in Georgetown and that’s all I’m saying about that. The Little Tavern in College Park MD has been vacant for many years and now is likely going to be demolished by the new owners, the University of Maryland College Park Foundation who are not forthcoming as to alternative plans other than expanding an existing parking lot. I am definitely opposed to the demolition of that Little Tavern restaurant ! I remember them well. One of my aunts worked at one in D.C. in the 1940s. Ate many good ‘burgers there! What an amazing collection of these Little Taverns. Always loved the architecture and the concept way more than the humid little burgers in their moist packages though. Georgetown Little Tavern lasted a long while. My aunt, Julia Frances Corder, used to work at a Little Tavern in 1944-45. It was located at 3rd Street and Pennsylvania Avenue in Washington, D.C. One night, my uncle, Edward Humphries Corder, and me drove a combined distance of approximately 150 miles (from my home in Amissville, VA to that Little Tavern and back) just to get hamburgers and coffee !! That was back in the early 1950s. I would love to find a photo of that Little Tavern to place in my autobiography . Ahhh… the memories!! I, too, am looking for a photo of the Little Tavern whose address became 655 Pennsylvania Avenue S.E., and later was operated between the 1990’s and 2014 as the L’il Pub. My parents lived on C Street S.E., and following their elopement at ages 17 and 18, walked 1/2 mile to this Little Tavern to celebrate their wedding. He was a sailor who had just returned home. We celebrated their 70th wedding anniversary this past Sunday. Joanne…..There is a photo(s) of the Little Tavern at 655 Pennsylvania Ave. It is posted in the “Little Tavern Locations”. A wonderful set of memories and history, thank you. I wish they were still around today. Can remember eating the delicious burgers at times when I lived at 907 H Street NW Washington DC . As I remember there were several of the restaurants in the area .It was 1959 and I am pretty sure it was 10¢ each for the burgers,man I thought I hit the jackpot , yummy ! I went to the Laurel Maryland location now known as Laurel Tavern Donuts on Friday afternoon, Dec. 2nd, 2016. They close at 4pm. A bag of 9 burgers is $9.99. They have one table with three chairs. The domain name littletavern.com is currently for sale. Loved the Little Tavern restaurants. My aunt Julia worked at the one located at 3rd and Pennsylvania avenue in D.C. Does anyone remember that particular restaurant? Anyone have a photo of it ? If so, please let me hear from you. My parents married as young teens in 1946 in a civil ceremony. They were frequent visitors to the 3rd and Pennsylvania avenue location. And, in fact, following their wedding ceremony they went there and ate burgers! My parents are both frail, but still alive and together in their own home. They will celebrate the 71st anniversary on February 5! I haven’t been to this site for quite some time, so I just now saw your posting. I would love to see/have a photo of that Little Tavern. If you run across one, please e-mail me at : rcorder91@aol.com. Thanks for replying to my earlier posting! my mother use to be the manager of the little tavern on back river neck road in essex.i didn’t see a picture of that store here. It’s on the list, but I’ve been unable to find any confirmed photos of it. If you have a shot, I’d love to see it! My wife and I were talking about the good old days mostly about Little Tavern Hamburgers. We were saying that it would be nice if some builder would bring back some of those shops. The food was the best ever. Does anyone else agree with us. It would also bring back some of our history. fortunately or Unfortunately, White Tavern now sells their hamburgers in grocery stores in the frozen foods section. White Castle? If you can believe it, they’ve been doing that since the 1930s. Hello Robert I would love to see a picture to see if I can identify it and the location. found this site because there’s a LT that’s being moved. It’s at the corner of 6th and Morse Sts NE in Washington, DC. Just west of Gaulledet U. It was a Subway until a while ago then it closed and I may remember it being a Little Tavern, but that’s been a while too . The whole area is being redeveloped. BUT, I didn’t see a picture of this LT in the photos above. No. 27, toward the bottom of the page, pictured during its operational heyday. It was one of the last Little Taverns built.